All Gamblin Artist's Oil Paints are completely non-toxic when used as recommended. Most are made with alkali-refined linseed oil as a binder, which creates a strong, flexible paint film and yellows significantly less than cold press linseed oil, the traditional binder in oil paints. Select colors use safflower oil as a binder. Not only are these vegetable oils completely non-toxic, they are commonly used in health and beauty products, so you can trust in their safety. 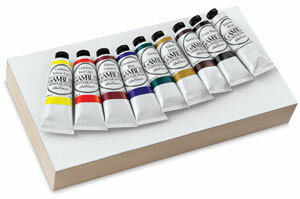 Introductory Set — This set gives painters a thoughtfully constructed palette of luscious oil colors cradled in a primed, ready-to-use, 12" × 6½" painting panel handcrafted in North America from sustainably forested birch. Colors include Cadmium Yellow Light, Yellow Ochre, Burnt Umber, Cadmium Red Light, Alizarin Crimson, Ultramarine Blue, Viridian, Ivory Black, and Titanium White in 37 ml (1.25 oz) tubes. 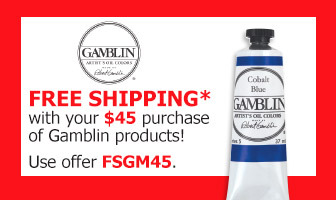 Artists can paint solvent—free with all Gamblin Artist’s Colors by mixing them with Gamblin’s Solvent-Free Gel Medium or with moderate amounts of Gamblin Refined Linseed Oil. For cleaning your brushes consider using Gamblin’s Gamsol Solvent, the safest artist’s solvent available. Or, simply wipe away excess paint from the bristles, work in a bit of Gamblin Refined Linseed Oil, then follow with water and soap or a brush cleaner. *Exclusions apply, click here for details. The Gamblin Company was born in 1980 in a small garage in Portland, Oregon, where Robert Gamblin spent nine months mixing batch after batch of oil paint by hand. See what inspires Robert Gamblin and understand the integrity and dedication behind what makes some of the finest oil products around.